NEW YORK - Former "NBC Nightly News" anchor Tom Brokaw revealed Tuesday that he has cancer but said he is "very optimistic about the future." Brokaw, 74, was diagnosed with multiple myeloma, a cancer affecting blood cells in the bone marrow, in August at the Mayo Clinic in Minnesota. There is no cure, but new treatments can help keep the symptoms in check. His doctors are optimistic about his prognosis, NBC said. 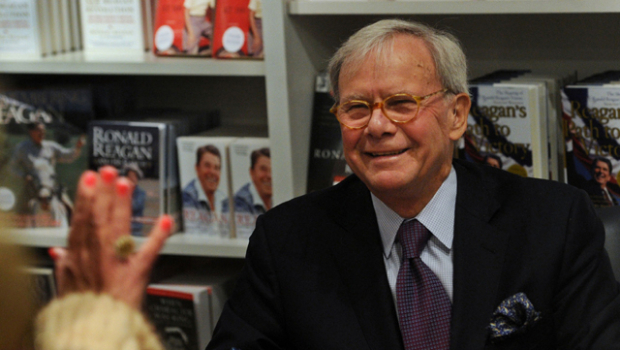 "With the exceptional support of my family, medical team and friends, I am very optimistic about the future and look forward to continuing my life, my work and adventures still to come," Brokaw said in a statement. "I remain the luckiest guy I know," he said. "I am very grateful for the interest in my condition but I also hope everyone understands I wish to keep this a private matter." Brokaw began working at NBC in 1966. He served as an anchor and managing editor of "NBC Nightly News" from 1982 to 2004. Brokaw is now an NBC News special correspondent and had continued to work on projects during his treatment, the network said. These include a two-hour documentary on the assassination of President John F. Kennedy and appearances on "Today," "NBC Nightly News with Brian Williams" and "Meet the Press" as well as on MSNBC. He is also contributing to NBC Sports coverage of the Winter Olympics in Sochi, Russia, the network said.